I have long wanted to make these beautiful little fruit gems. I don't know why I waited so long, but finally, last night, I decided it was time! 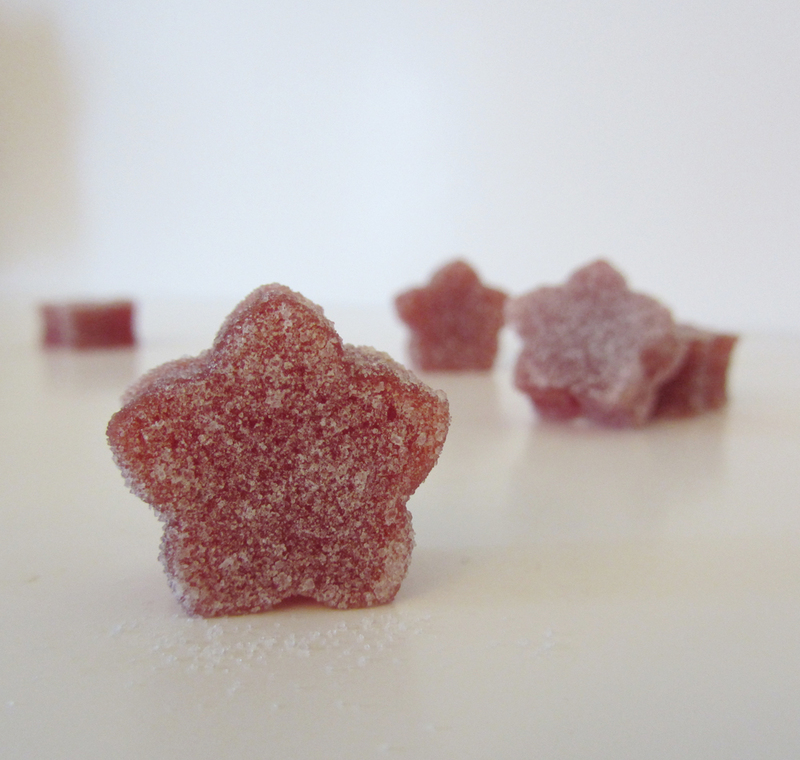 Pate de fruit is a classic French confection. The correct pronunciation sounds like pawda-fwee. Translation (not so fancy): fruit paste. If you've never had it, let me try to describe it for you. Think of the best jam you've ever had. Not too sweet, very fruity; just delicious. Now, picture this jam being strained and reduced by half. Thick, almost creamy it's so soft, and singing with fruit flavor. That is pate de fruit. Intense; it is the essence of the fruit. I found a recipe for pate de fruit, credited to Tartelett, at Treats. I did change the recipe, mainly because I was using strawberries instead of peaches (I can't wait to make peachies, too). This recipe is really simple, but don't even start cooking if you don't have a lot of time. You'll be at the stove for a good little while. Stirring. Reducing. When all is said and done, though, you'll be happy you spent that time. Pate de fruit...is...so...good. 1. Line an 8" X 8" baking dish with parchment paper. Set aside. 2. Puree the berries. Pour the puree through a fine mesh strainer into a large saucepan. Add the lemon juice and 1/2 cup of the sugar. Put the pan over medium-high heat. 3. Cook, stirring constantly, until the mixture reaches 113°. Reduce the heat to medium. Stir in the remaining 1 1/2 cups sugar and the pectin. Cook, stirring constantly, until the mixture reaches 200°. 4. Keep the mixture at a steady 200° for 3 minutes. Reduce the heat as needed. The mixture may foam and bubble at this stage. 5. Continue cooking, stirring constantly, until the mixture reaches 223°. This step takes a long time. You are essentially removing most of the water now. 6. Keep the mixture at a steady 223° for 3 minutes. Reduce the heat as needed. 7. Remove the pan from the heat. Pour the mixture into the prepared baking dish. Let cool completely. 8. With an oiled knife or cutter, cut the pate de fruit into any size and shape you'd like. Roll the candies in the superfine sugar to coat. To store: cover and chill.